I just finished reading Arturo Pérez-Reverte's The Flanders Panel. It was a fairly enjoyable read, although I think Pérez-Reverte's write-up in Wikipedia might be going a bit far when it compares him to Hemingway, telling us about "... the author's Hemingway-like ability to build layers of complexity around each person." I'm not sure that Pérez-Reverte would be happy with the comparisons. Apparently, "... he does not give a damn about Hemingway ... [and] ... with the passing of time he has come to hate Hemingway and his pathological continuous assertion of virility..."
Anyway! The Flanders Panel. I won't bother ruining any of the plot - it's a story about an old painting that depicts a chess game, and the intrigue that flows on from the painting being restored, ready for auction. An inscription is found during restoration - you find out all of this in the first couple of pages. 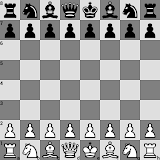 On page 96, though, we have the chess position shown below, and one of the characters states, amongst his analysis on what the last move may have been, "[The] pawn on A5 couldn't have moved either, because it's between a white pawn and its own black king." That doesn't make any sense to me. Surely the reasoning to explain that the pawn on A5 hasn't moved is because the only square it could have come from - B6 - has a white rook on it, so there's no way the pawn came from there in the last move of the game.